Happy 1st Sunday of the Month! That means it's September. 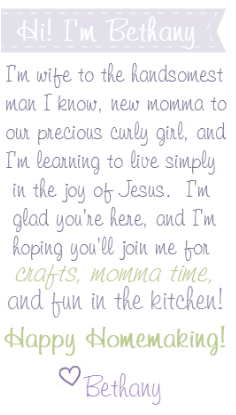 I don't know if my heart is ready for it to be September...that means that my precious curly girl is turning o n e y e a r o l d in 24 days. I'm not ready, I'm not ready! But we're making the best of her adorableness and realizing that even though she's growing bigger every day, she'll never be this little again. So, we're also celebrating her littleness. 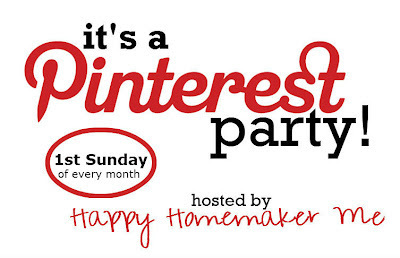 If this is your first Pinterest Party, feel free to read about how I host them here. Also, if it's your first, thanks so much for joining! I hope you'll stick around. I love the way that these Pinterest Parties challenge me to always try new pins. It's the whole point of having a Pinterest account, isn't it?!? Well, the project I'm sharing this month has a little bit of a back story. All of Kayleigh's life, her Auntie Laura has had a special song just for her. Whenever she sees Kayleigh, my youngest sister sings "Your Personal Penguin," and Kayleigh just smiles and smiles. When Laura went to Ireland for a few months in the spring, she sent this video to Kayleigh. It's not the greatest quality because of the poor internet connection she had over there, but it's so dear to my heart that the happiness I get from watching my sister sing to my daughter cancels out the pixelation, time/speech delay, and sound quality. Laura has an incredible, beautiful voice, and I love listening to her sing--whether it's while she's sitting next to me, strumming her guitar, or whether she's on the other side of an ocean, singing a little ditty for her niece. This video makes me so happy. Laura is back from Ireland, but wasn't home for long. Now she's halfway across the country beginning her first year as a college student away from home. College is full of wonderful new adventures, but I remember being homesick for my family, and the university I attended was only 2 hours away from home. I knew that Laura must be missing things from home, so I thought I'd make her something that was sure to bring a smile to her face. I'm not sure whether we count Kayleigh as Laura's personal penguin, or if Laura is Kayleigh's personal penguin, but either way, when I saw this precious footprint craft by Jill of Meet the Dubiens, I knew that something like it was going to have to find its way to Auntie Laura's new dorm room. Once the black paint dried, I painted white over it to make it more penguin-y and then added the beak, wings, and googly eyes. I also added a red bow tie, because I figured any penguin of Laura's would, of course, be wearing a red bow tie. Well, now it's your turn! What fun things have you been working on, lately? 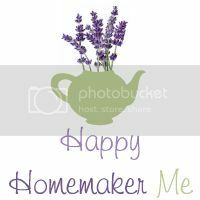 Please be sure to visit some of the other blogs and leave some Happy Homemaker love!